Creator owned comic books and graphic novels for fans of horror, supernatural, sci-fi, and super hero titles. As one of the biggest series in the DC universe, Detective Comics was going to have a lot to live up to. Tony Daniel, who has worked on Batman in the past (Battle for the Cowl, Batman: R.I.P. ), seems up to the challenge. I’ll warn readers right now, this is a creepy story being set up. I mean, the cover has bloody baby doll heads with the Joker in the midst of them on it. I knew Daniel would be up to the task for the art, but I wasn’t sure how he would float as a storyteller. Folks, he doesn’t disappoint. The story moves quickly and it’s hard to look away from it. There are lots of creepy things going on and it’s definitely not for kids. Of course Batman is a vigilante, running from the law, but he has it in good with Jim Gordon, who tries to protect him. 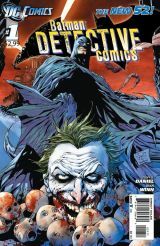 Batman gets involved in chasing the Joker, who already has some past built up, and the police are trying to stop both of them. I really like this version of the Joker. He’s insanely psychotic, and has a taste for blood. Batman is as great of a detective as he ever was, but seems to be a rookie, or a younger man with less experience. In the fights, Batman’s not always in total control of the situation and he takes a few good hits. I really like that, because I was tired of the Batman character that was unbeatable. He always had a plan, he always saw everything coming, he always won. This Batman doesn’t know Joker’s next move and seems to be playing catch-up. I won’t spoil the ending, but be sure you don’t read it right before you go to bed. Also, I’ve discovered (and I’m sure many of you have also) that the hooded-woman in the last issue of Flashpoint is appearing in EVERY issue of the New 52. She usually has some kind of red aura around her and is in big crowds. Keep your eyes peeled, guys and gals. Also, keep your eyes peeled for more great reviews and web comics here at Champion City Comics! Michael Newton is a contributing writer at Champion City Comics. Copyright Champion City Comics 2009. Picture Window theme. Powered by Blogger.